"Continuous Discussion" Video Podcast today! The next episode of the "Continuous Discussion" video podcast will include a panel discussion about the upcoming DevOps Enterprise Summit in Las Vegas this October. I'll be on the panel. You won't want to miss it! See you there! The video of my SRECon talk is finally available! "Operational Excellence in April Fools' Pranks: Being Funny Is Serious Work!" at SREcon18 Americas is about mitigating the risk of "high stakes" launches. On a personal note, I'd like to thank the co-chairs of SRECon for putting together such an excellent conference. This was my first time being the last speaker at a national conference, which was quite a thrill. I look forward to SRECon next year in Brooklyn! Free book: "Expanding Pockets of Greatness"
Companies don't make their "DevOps transformation" over night. Usually there is a small team that adopts devops practices and then, after proving their success, the practices spread throughout the company horizontally. However sometimes their success becomes an island. There is no momentum and the better practices fail to expand around the company. Growing devops practices within a company is not easy. It is especially difficult when it does not have management support, or the advocate does not executive authority. Some techniques for building momentum work, others do not. Earlier this year Josh Atwell, Carmen DeArdo, Jeff Gallimore, and myself sat down to write a list of techniques we've seen succeed. No theory. No hyperbole. No fluff. We wanted to write down what we've seen work so that other people can copy these simple but effective techniques. This is a book for people in the trenches, not executives. We realized that the list didn't need to be long nor did it need to be exhaustive. 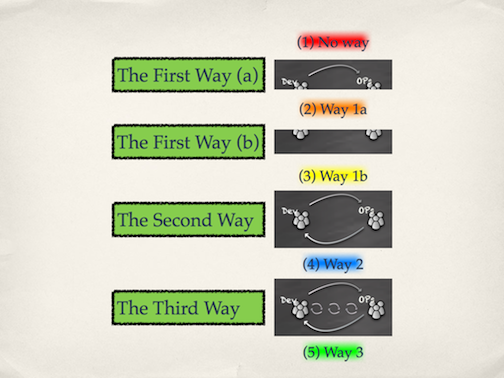 There are 2-3 that are simple, powerful, and almost always work. This didn't need to be an encyclopedia! The result of this list is a new 14-page free book from IT Revolution called Expanding Pockets of Greatness: Spreading DevOps Horizontally in Your Organization. You're not alone. DevOps is out there in your organization. We want to help you find it and scale it. 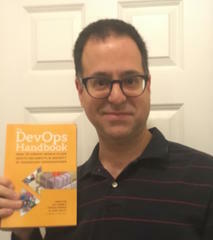 DevOps Handbook hitting stores Oct 6! One of the most anticipated DevOps books in years is about to start shipping! DevOps Handbook: How to Create World-Class Agility, Reliability, & Security in Technology Organizations by Gene Kim, Jez Humble, Patrick Debois, and John Willis is the practical guide to doing all the wonderful things that The Phoenix Project talks about. I've received an early copy of the book and it is excellent. It is very down-to-earth, practical, advice. I'll write more next week when I've had time to read the entire thing. You can pre-order it directly from IT Revolution or via Amazon. There are two things you can do if you want to understand the future of system administration. First, if you want to see what DevOps will be like 5-10 years out, you can read the amazing new book, Site Reliability Engineering: How Google Runs Production Systems . I read a preview copy and it was excellent. Many different Google SRE teams got together to produce a very well-rounded book that covers all aspects of Google's SRE program, which is easily 5-10 years ahead of the industry. (Pre-order from O'Reilly or Amazon Kindle or Paper) Congrats to the editors Betsy Beyer, Chris Jones, Jennifer Petoff, and Niall Richard Murphy on a great addition to the IT cannon. Pearson / InformIT.com is running a promotion through August 11th on many open-source related books, including Volume 2, The Practice of Cloud System Administration . Use discount code OPEN2015 during checkout and received 35% off any one book, or 45% off 2 or more books. If you own a Boeing 787 Dreamliner, and I'm sure many of our readers do, you should reboot it every 248 days. In fact, more frequently than that because at about the 248-day mark, the power system will fail due to a software bug. Considering that 248 days is about 2^31 * 100, it is pretty reasonable to assume there is a timer with 100 microsecond resolution timer held in a 32-bit unsigned int. It would overflow every 248 days. "Hell yeah, I did it! I saved 4 bytes every time we store a timestamp. Screw you. It's awesome. a software engineer that makes planes but doesn't have to operate them. Reminds me of all the commercial software I've seen that was written by developers that didn't seem to care, or were ignorant of, the operational realities that their customers live with. Last week at DevOpsDays NYC 2015 I was reminded time and time again that the most important part of DevOps is shared responsibility: The opposite of workers organized in silos of responsibilities, ignorant and unempathetic to the other silos. You've probably seen experiments where a mouse gets cheese as a reward for pulling a lever. If he or she receives the cheese right away, the brain associates work (pulling the lever) with reward (the cheese) and it motivates the mouse. They want to do more work. It improves job satisfaction. If the mouse received the cheese a month later, the brain won't associate the work with the reward. A year later? Fuggedaboutit! Now imagine you are a software developer, operations engineer, or system administrator working on a software project. The software is released every 6 months. The hard work you do gets a reward every 6 months. Your brain isn't going to associate the two. Now imagine monthly or weekly releases. The interval between work and reward is improved. The association is stronger. Motivation and job satisfaction goes up. Now imagine using a continuous build/test system. You see the results of your work in the form of "test: pass" or "test: fail". Instant gratification. Now imagine using a continuous deploy system. Every change results in a battery of tests which, if they pass, results in the software being launched into production. The interval is reduced to hours, possibly minutes. People that complain that the enterprise world doesn't get DevOps but don't participate in enterprise conferences. Lack of a "sound bite" definition of DevOps; leads to confusion. I was recently told "DevOps means developers have to carry pagers... that's why our developers don't want anything to do with it." If that's the definition that is getting out, we're in trouble. Engineers thinking that "if something is good, it doesn't need marketing". Tell that to the many inventions of Nikola Tesla that never got turned into products. The "build a better mouse trap and people will beat a path to your door" myth was debunked years ago. So... what are you doing to change this? I wonder if he know how much influence he had on DevOps culture. The Three Ways of DevOps are essentially The Toyota Way applied to system administration.